Here I am, with a fresh start into the year 2009, and a fresh review to, erm, celebrate the new year on this later day. That's how much I love to celebrate. Today's movie of choice is Cloverfield, as directed by Matt Reeves and written by Drew Goddard (who is also responsible for some episodes of Buffy, Angel, Alias and Lost, besides for being known as co-executive producer of aforementioned Lost) - and, ladies and gentlemen, ghouls and ghosts, I am pleasantly surprised. 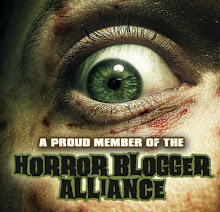 Living on teh intarwebz, so to speak, I had of course read a lot of differing opinions on the long-awaited monster-movie of 2008, not all of them positive. When TF, who had eagerly awaited this movie since the marketing campaign had started way back, finally got his fingers onto the movie (I gave him my copy before watching it myself), was disappointed, my expectations were lowered even more. But alas - this movie is actually awesome. Disclaimer: I'm under the influence of a soothing herbal mix. A group of friends (and acquaintances) is throwing an unexpected surprise farewell party for their mate Rob Hawkins, a young man living in Lower Manhatten, New York, because he's going to leave the city - and the country, even! - in order to work in Japan. This, of course, warrants alcohol and fun for everyone. One of those friends responsible for the surprise is Hub, who is more or less forced to record the testimonials of the people hanging out and chilling, so that Rob can watch the tape when he's far away from home. That was the only part of the movie that I really could have done without and that bored me. But the hand-held camera is very realistic (something that, luckily, carries on throughout the whole movie, but more on that later) - I've had the misfortune to see such things a few times before, and it is very ...authentic. We get to know the people at the party, the gossip, the relationships between them - who is together with whom, who is sleeping with whom, who had an affair with whom and who might break up with whom... just a typical party with all the human drama that those things entail, after enough alcohol has flown and emotions started making complicated things even more complicated. Actually, I started to get curious... and suddenly, a big crash shakes the building, and outside, some parts of the city lose electricity. Soon, the TV reports a possible earthquake in Lower Manhattan, with an oil tanker capsizing near the statue of liberty. The people decide to go there and see what is happening... and the camera follows. Then - an explosion - panic. Sirens and alarms ring, people flee wildly through the streets - and no one knows what's happening. But in the background, there's a sound... like the roaring of a giant monster. ... and SOMETHING is moving. Something eery. Something big. Gigantic, thunderous steps shake the buildings, the roaring fills the air with primeval, animalistic sounds. And all around, there are sirens, people screaming, police cars... and dazed survivors of the monster's wake. Manhattan is burning - a wasteland. Cars crashed, people crying, buildings shattered... and the severed head of the statue of liberty, like a blind reminder of what is being destroyed. Unlike Romero's Diary of the Dead, Cloverfield's camera doesn't exploit what is happening, doesn't want to bring some Truth - it just happens to be there, and records what is happening in a very subjective way. It's much less clean-cut and professional, but much more engaging for the viewer. It's like being in the middle of what happens, and it works for me. Then again, I'm stoned right now. The monster is awesome. You can't really make it out, you only get glimpses of limbs, partial glimpses of body parts, and the sight is always partly covered, the cam shaking, and the frantic authenticity of the camera instills a sense of expectation and adrenaline rushing. Even a bit of terror at times. Something that I found very good is that people in this movie actually get injured and attacked by critters and survive, without shrugging it off as if it were nothing (alternatively, dying...). The scenes in the makeshift sick bay are pretty good (though short), and the presence of the military and its stressed, aggressive but yet disciplined behaviour adds a good deal to the hectic feeling of the movie. 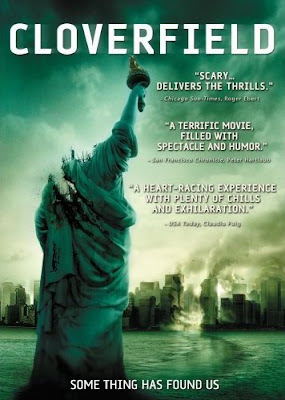 The style which is employed in Cloverfield leaves much to the imagination of the viewer. An individual with a certain sense of phantasy can fill in a lot during those scenes which leave the mind time to think, or to combine parts of a picture into a warped hole. And I want to add yet again that the monster is awesome - full of win and awesome, in fact. I heartily recommend watching this movie whilst being under the influence of your favourite herbal blend (perfectly legal, of course - I'd never condone the use of natural, healthy substances like the products of the cannabis-plant, because it's illegal and bad). Good stuff (both). 8/10 viciously cool limbs which move in a really cool way.